While in middle school, Bernardy indulged in his passion through a robust music program at school. “The music department would hold classes after school and even during lunch. It was a great environment for a blossoming musician. Through the music program, I was exposed to all types of music, but I fell in love with jazz specifically,” said Bernardy. Towards the end of high school when it came time to look at colleges, Saint Mary’s was one of the schools Bernardy looked at as his father is an SMC graduate. “When I was looking around for schools, I wanted to make sure I had the option to play music. I wasn’t so set on being a musician that I wanted to go to a strictly music-based school. I wanted a diverse campus where I could study business and also music,” said Bernardy. Bernardy’s father researched the Performing Arts Department and contacted music Professor John Maltester. When Bernardy and his father came to Saint Mary’s to visit, Bernardy had a private lesson with adjunct Professor Mary Fettig, who he continues to have lessons with to this day. “I was really impressed that I was able to take a private lesson at the college before even applying,” recalled Bernardy. Unlike many academic institutions that only offer scholarships to students majoring in the performing arts, Saint Mary’s has four-year, renewable scholarships available to students who major or minor in the performing arts. This arrangement has allowed Bernardy to continue studying his passion while also becoming educated in business and finance. According to Bernardy, Saint Mary’s offers a lot of diversity in classes and provides different ways of thinking. “The way you think in a jazz class has similarities and differences to how you would approach an academic class. It allows you to tie things together, and to see things more clearly. That kind of balance is really helpful in all kinds of subjects,” said Bernardy. “I wouldn’t be here without the scholarship—and I wouldn’t have the opportunity to experience the unique learning opportunities at Saint Mary’s,” recalled Bernardy. He also pointed out that the performing arts scholarships help many people in the music program. “A lot of people can’t afford to go to music conservatories and spend over $60,000 a year for a strictly music-based education,” said Bernardy. One of Bernardy’s favorite aspects of studying at Saint Mary’s is the chance to have private lessons with the music faculty each semester. “Most of the knowledge I have acquired here at SMC has come from my private lessons with Mary Fettig. It’s 600 minutes of instruction per semester (10 lessons at 60 minutes per lesson). Since working with [Fettig], I’ve completely overhauled my technique and I’ve improved my sound,” said Bernardy. “It has been a blessing to have such a great private teacher.” Bernardy also points out that previously minors were given 45 minutes per lesson, and majors received 60 minutes. 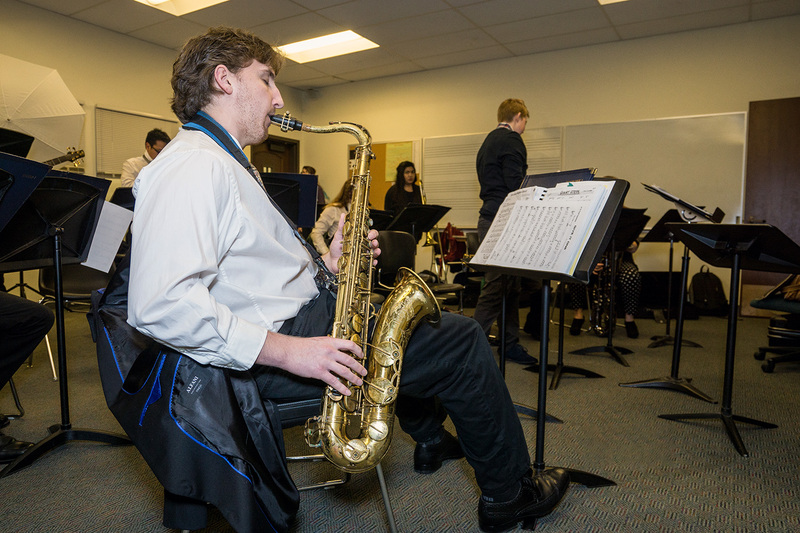 Now, both majors and minors can take up to 10 hour-long private lessons per semester in the music department, included as part of their tuition.